Menzel Elektromotoren shows a selection of motors from its huge portfolio at Hannover Messe and is looking forward to discussing individual drive solutions with trade fair visitors. The family-run company supplies customers around the world and specializes in project-specific configuration and fabrication of large industrial motors. Menzel Elektromotoren supplies steelworks and mills with tailor-made robust roller table motors with nominal voltages up to 1000 V and up to 400 mm frame size. The family-run company, which specializes in large industrial motors, has the flexibility to manufacture small series of roller table motors or single units. Menzel Elektromotoren supplies steelworks and mills with tailor-made robust roller table motors with nominal voltages up to 1000 V and up to 400 mm frame size. The family-run company, which specializes in large industrial motors, has the flexibility to manufacture small series of roller table motors or single units. These TENV (totally enclosed non-ventilated) three-phase squirrel cage motors feature IC410 cooling type and thermal class F, or optionally H. The ring-fin motors come in a cast-iron housing or can be optionally fitted into a low-vibration welded steel housing. They are suitable for direct power supply as well as for inverter operation, and notably also for high-frequency reversing operation under load. The motors provide high nominal, acceleration, and breaking torques. They are low-maintenance, durable, and extremely robust under electrical, mechanical, and thermal stress. Menzel configures the frequencies and pole counts for high overall efficiency and implements speeds according to customer specifications. Special configurations with extremely high pole counts and low speeds make gearboxes unnecessary in many cases, reducing purchase costs and maintenance. The roller table motors feature IP55 ingress protection by default. On request, Menzel supplies IP67 units for especially demanding applications. Most recently, Menzel fulfilled an order of several roller table motors with an integrated brake, 7.7 kW rated power, and 490 rpm. Based on a specimen provided by the customer, these motors are engineering to match an original design by a motor manufacturer who went out of business. Readers can find more information and request a quote at https://www.menzel-motors.com/specialized-motors/roller-table-motors/. Menzel Elektromotoren has quickly supplied a replacement for a failed motor driving a sugar centrifuge. Equipping a large motor for vertical installation with foot mounting and with the driven end above, requires a high level of expertise. Menzel mastered this challenge within a very short time. Menzel Elektromotoren has quickly supplied a replacement for a failed motor driving a sugar centrifuge. 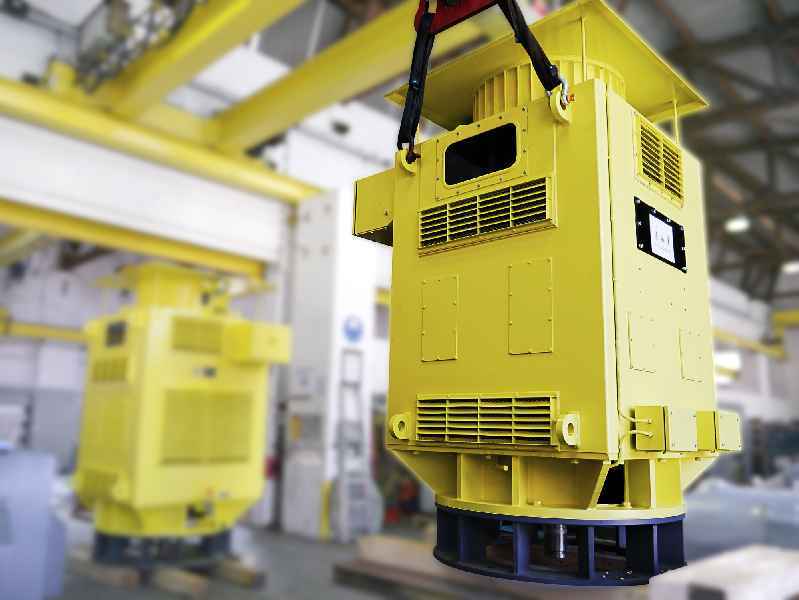 Equipping a large motor for vertical installation with foot mounting and with the driven end above, requires a high level of expertise. Menzel mastered this challenge within a very short time. 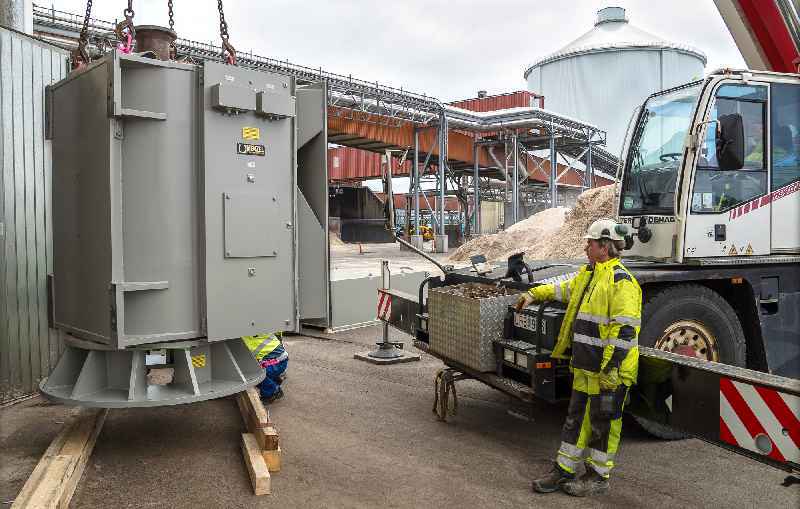 Only 15 days after receipt of order, the customized motor was at the installation site, at a Swedish sugar refinery. The customer requested a squirrel-cage motor with a 1800 kW nominal output. Menzel has this kind of motor readily available in its extensive warehouse stock. The drive manufacturer built the large flange in its own welding shop, applying the usual high standards on the workmanship. Menzel also drew on stock components to assemble a cooler according to the specified cooling type IC616. Additional motor parameters include 690 V rated voltage, IP55 ingress protection, 743 1/min nominal speed, and configuration for 0…70 Hz frequency converter operation. The German drive specialists closely cooperated with their Swedish office throughout this project. The company has subsidiaries in several European countries and works with experienced partners around the world. 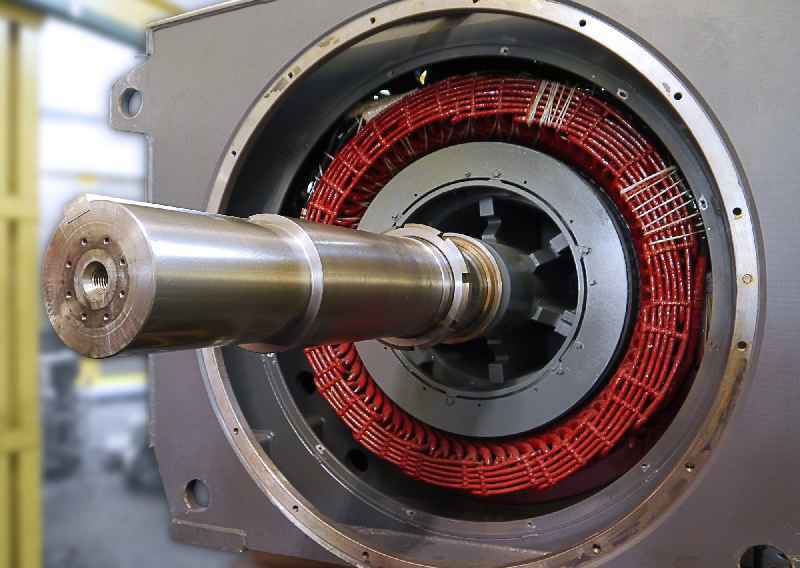 Menzel supplies three-phase asynchronous motors with a squirrel cage-rotor for a wide range of industries and industrial applications of all kinds. More information is available at https://www.menzel-motors.com/squirrel-cage-motor/. Menzel Elektromotoren not only provides electric motors to end users directly, but is also a supplier and partner of drive manufacturers, distributors, and maintenance companies. The German manufacturer carries a large stock including many unusual motor versions and is highly experienced in customized motor adaptations. Menzel Elektromotoren not only provides electric motors to end users directly, but is also a supplier and partner of drive manufacturers, distributors, and maintenance companies. The German manufacturer carries a large stock including many unusual motor versions and is highly experienced in customized motor adaptations. Other manufacturers and integrators therefore rely on Menzel as a trusted source. In many cases, Menzel can assist in the short term, if end customers have particularly challenging demands. Many repeated orders are proof of highest quality and reliability. A Canadian system integrator has recently placed its third order: Menzel was to supply a spare motor for a cement plant and had to meet very exacting requirements. 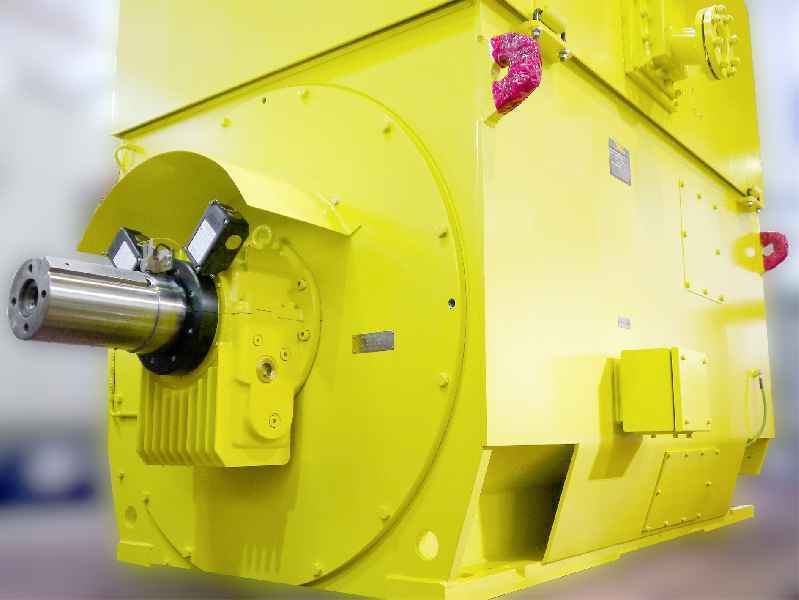 The new slipring motor must be able to replace three existing crusher motors in case of a failure. To ensure smooth commissioning at the installation site, which is characterized by very tight space restrictions, Menzel’s project manager took the measurements in Canada himself. Menzel chose a 4.5 MW motor from stock, built an extended shaft, and furthermore fitted adapter plates with mounting holes for all three locations as well as brackets for plug and play mounting of vibration sensors for condition monitoring. In addition, the terminal box was fitted with long feeder cables to facilitate the third-party connecting-up. An overview of Menzel’s slipring motor range is available at https://www.menzel-motors.com/slip-ring-motor/ic611-ic616-ic666/. 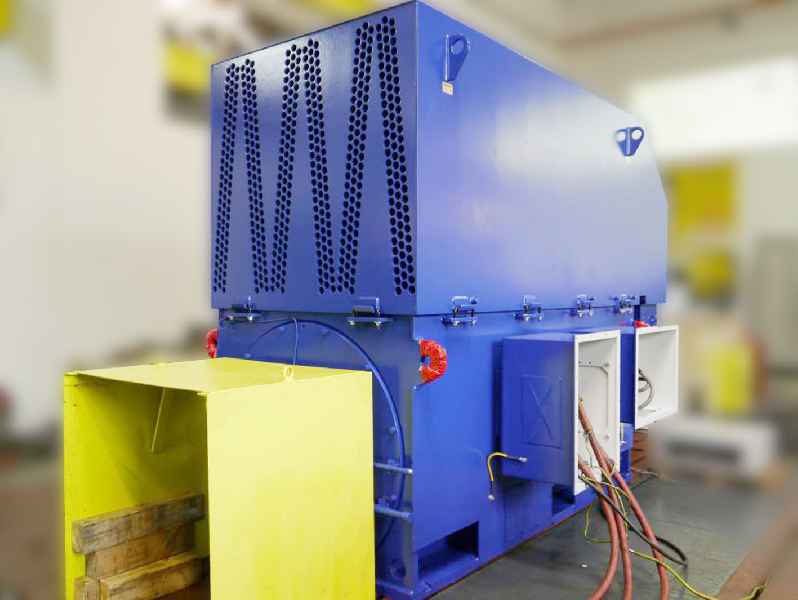 Two German drive technology manufacturers have custom-tailored a motor-and-generator system for the testing of large-scale transformers: Menzel Elektromotoren and Hempel Elektromaschinenbau collaborated to design a special drive solution for a wide frequency range 50 Hz to 100 Hz. Menzel Elektromotoren has built two special motors to meet exact customer specifications for all mechanical and electrical properties. A waterworks in the United States needed replacements for very old pump motors with low speeds of 391 min-1 and 439 min-1. Menzel Elektromotoren has built two special motors to meet exact customer specifications for all mechanical and electrical properties. A waterworks in the United States needed replacements for very old pump motors with low speeds of 391 min-1 and 439 min-1. 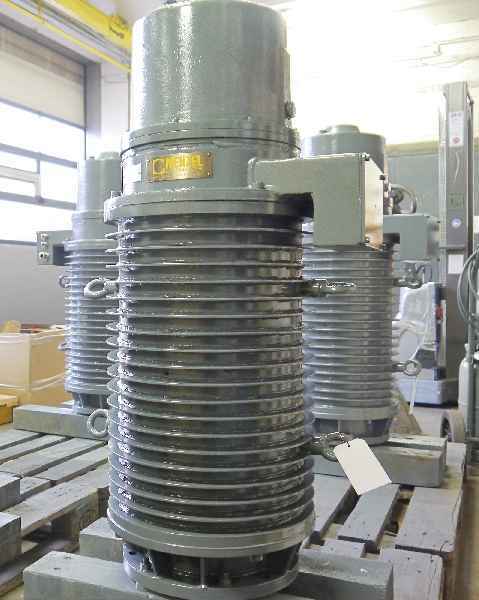 The order was for two vertical slipring motors with outputs of 335 kW and 700 kW, each with 4000 V rated voltage. 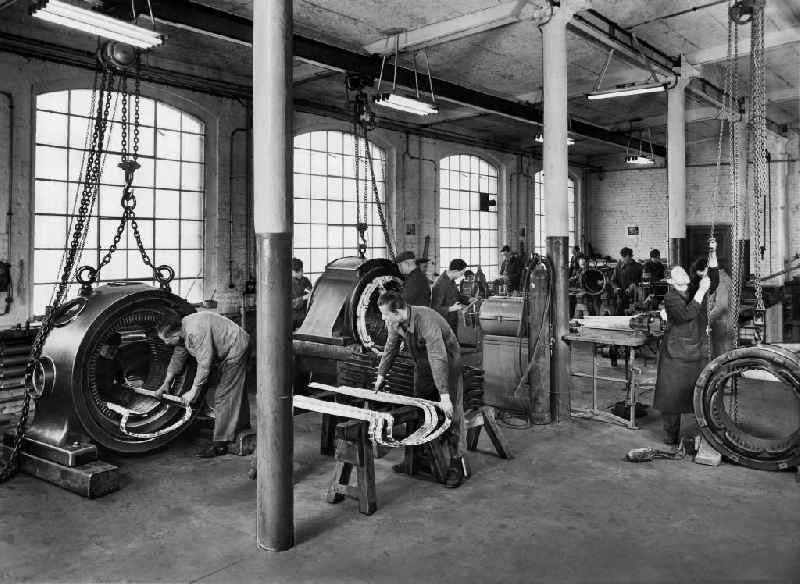 Menzel manufactured two bespoke motors from scratch, including the motor windings. A particular challenge, the external dimensions of the old drives also had to be precisely matched for the same total height with protective hood, terminal box placements, and arrangement of cooling air intakes and outlets. Menzel has a wealth of experience in special motor engineering and is adept at meeting such requirements. The company designed and welded the special enclosures in-house. Implementing the exact same dimensions of the old motors ensured easy and time-saving replacement on site in the pumping station. Before shipping, the motors underwent a load test according to the bi-frequency method in Menzel’s test field in Berlin. All outlined parameters were met to the full satisfaction of the customer. Menzel has been supplying the customer, a U.S.-based drive manufacturer, with special motors for several years, especially when they had to meet particularly short delivery times. Customers of Menzel Elektromotoren can now choose to monitor the testing of their motors via the internet. This new service complements the existing option to attend the tests on site in Berlin, a welcome opportunity for many domestic and international customers to become personally acquainted with the family-owned company and to visit the factory. From now on, live online observation is available anywhere in the world. 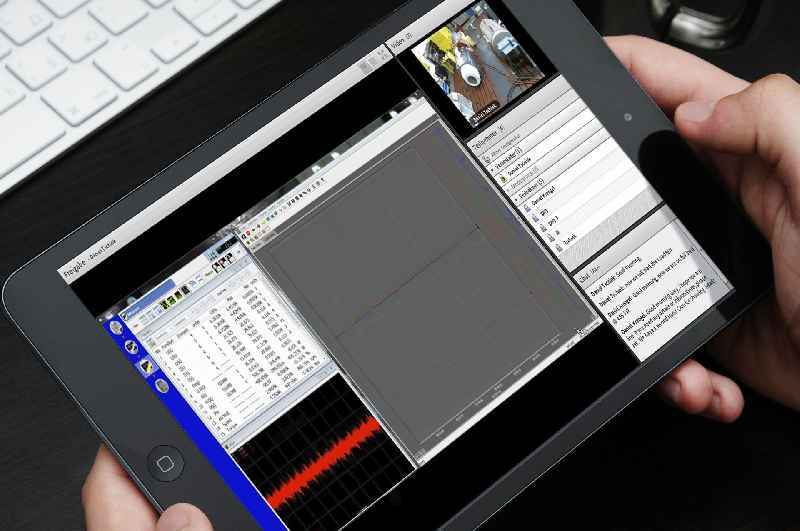 A special software enables real-time transmission and display of all data as well as video streaming from two static cameras and a handheld camera. Test engineers wear headsets to communicate with observers throughout the tests. They can use the handheld camera to focus areas of particular interest as directed by a remote customer. This creates maximum transparency. This innovative service helps Menzel demonstrate how individual low and high-voltage motors and DC motors meet the required specifications regarding performance, thermal behavior, durability, and efficiency. The test field features state-of-the-art measuring equipment for electric motors up to 13.8 kV. It is also available for manufacturer-independent checks and inspections. In addition to synchronous and induction motors, Menzel supplies and tests generators, variable-frequency drives, and entire drive systems comprising a transformer, inverter, and motor. Customers can make very flexible use of the testing services to the extent they require, thus saving a great deal of time and money during project planning and implementation. 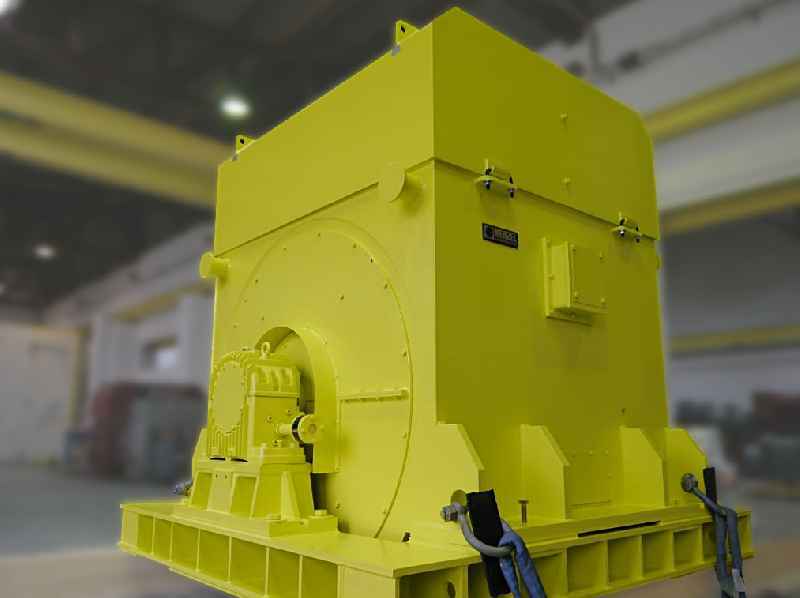 Menzel Elektromotoren has quickly adapted and tested a stock motor for a ball mill and expedited it to an iron ore mine. It took only three weeks before the unit was commissioned on site. 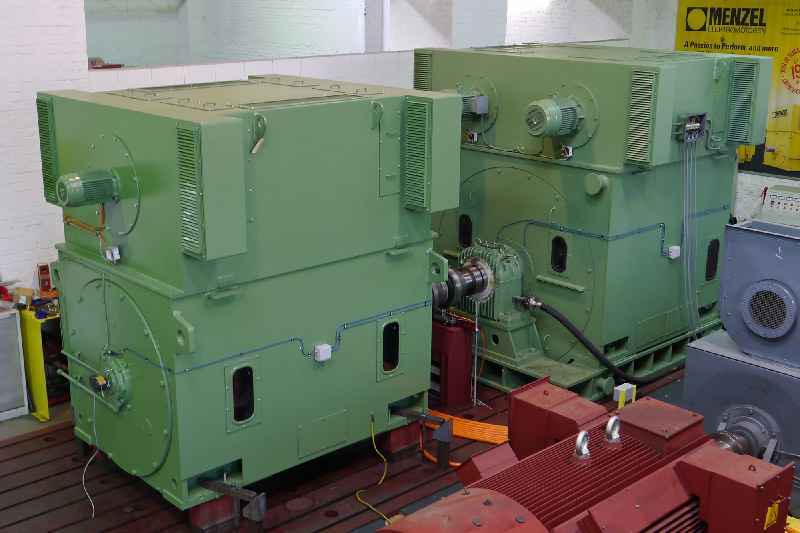 The customer had ordered a same-size replacement of the original motor with identical electrical properties: 6,750 kW nominal output and 6,600 V nominal voltage. 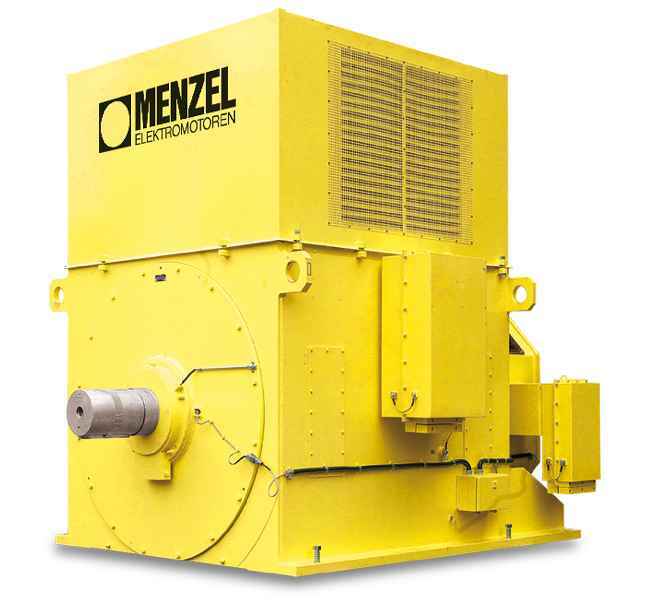 Menzel Elektromotoren has quickly adapted and tested a stock motor for a ball mill and expedited it to an iron ore mine. It took only three weeks before the unit was commissioned on site. 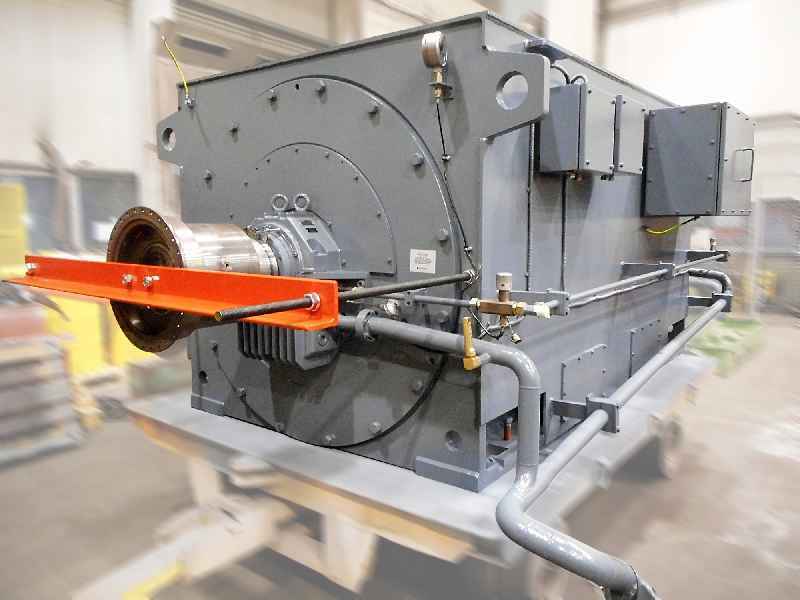 The customer had ordered a same-size replacement of the original motor with identical electrical properties: 6,750 kW nominal output and 6,600 V nominal voltage. Few if any manufacturers keep motors of this size in stock. That is why such units are usually manufactured to order and typically take several months to be delivered. Menzel was able to flexibly fulfill this order thanks to an exceptionally extensive and very varied range of stock motors. A star-connection 11 kV motor was rewired for 6.6 kV delta connection. Adapter base plates were adjusted for the existing bore hole pattern at the installation site. The motor has been especially tailored to the mill application to ensure maximum availability. It is extremely robust and withstands dust and vibration over the long term. Menzel Elektromotoren supplies Ex n (non-sparking) frequency inverters and electric motors for use in zones 2 and 22 with hazardous gas and dust atmospheres. Low, medium, and high-voltage motors for power ratings up to 5,000 kW and voltages up to 13.8 kV are custom-tailored. Menzel Elektromotoren supplies Ex n (non-sparking) frequency inverters and electric motors for use in zones 2 and 22 with hazardous gas and dust atmospheres. Low, medium, and high-voltage motors for power ratings up to 5,000 kW and voltages up to 13.8 kV are custom-tailored. They are shipped with an EU Declaration of Conformity according to ATEX Directive 2014/34/EU. For the long-established company with over 90 years of experience in electrical drive technology and industry-specific motor manufacturing, gas and dust explosion protection for hazardous area systems is a routine issue. Two current projects include orders for several drives with Ex n ignition protection. 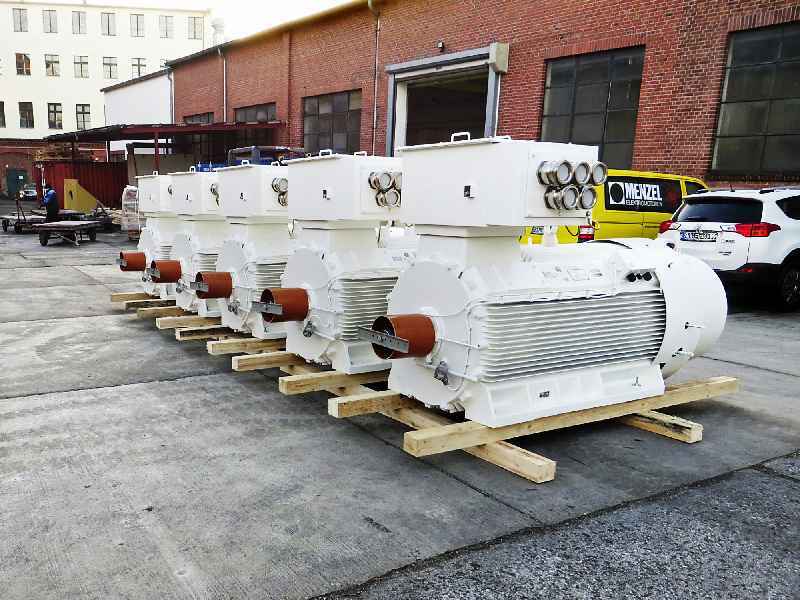 In one of these cases, Menzel recently delivered five 600 kW low-voltage motors for inverter operation to a site in Algeria. These units power multiphase gas and oil pumps at ambient temperatures up to 55 °C. In the other project, Menzel designed a slipring motor for a coal mill in Senegal as a superior alternative to squirrel-cage motor. The slipring motor has a lower inrush current and supplies higher starting torques. The plant operator has now placed a follow-up order for four identical mill drives for zone 22. The IP65-rated motors prevent any ingress of coal dust and keep particles from settling on slip rings and brushes. In addition, these systems will be supplied in slightly oversized housings to ensure that the operating temperature will not exceed 125 °C. The Menzel Elektromotoren homepage provides transparent insights into production facilities at the company’s headquarters in Berlin, Germany. The latest new feature is a virtual-reality tour through the load test field, part of the storage area, the shipping hall, and the paint shop. The Menzel Elektromotoren homepage provides transparent insights into production facilities at the company’s headquarters in Berlin, Germany. The latest new feature is a virtual-reality tour through the load test field, part of the storage area, the shipping hall, and the paint shop. The tour is animated by sound bites, video clips, and descriptive text about features and services. Information about historic milestones and the product range is also available. Menzel provides heavy-duty motors to customers throughout the world. Over 20,000 brand-new low, medium, and high-voltage motors as well as DC motors are always in stock, allowing for shortest delivery times. Knowledgeable staff are well equipped to quickly and flexibly implement customer wishes such as special windings and constructional adaptations. The family-owned company carries out all motor tests, a service that is not only available for in-house products – tests of third-party motors can also be commissioned. The test field features state-of-the-art equipment for load tests, heating tests, and other quality and durability checks. Generators and entire drive systems including a motor, transformer, and frequency inverter are tested as well. 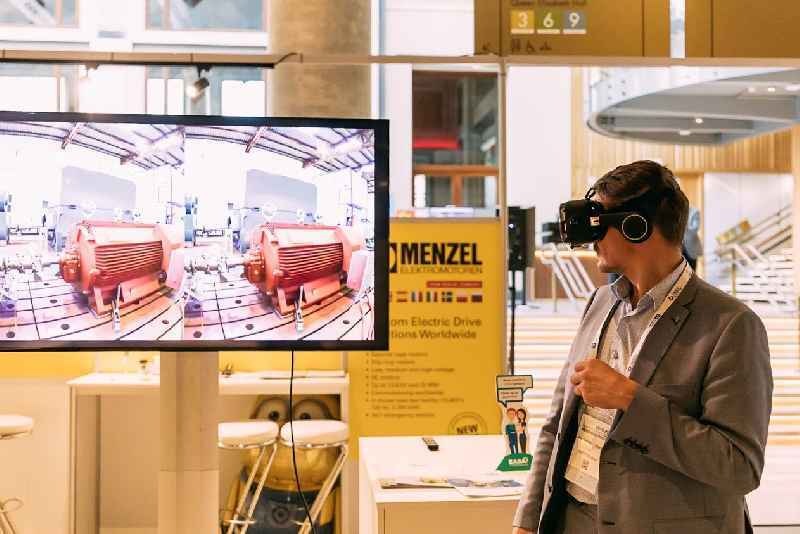 Link to the virtual tour: https://bit.ly/2HdqIk7 Hannover Messe 2018 visitors are in for a special experience – they can take a VR tour with special headsets at Menzel’s booth (Hall 15, Stand F35). At Hannover Messe 2018, Menzel Elektromotoren will present a huge motor portfolio in every sense of the word. The Berlin-based company has one of the most well-stocked warehouses in Europe for squirrel-cage and slipring low-voltage, medium-voltage, and high-voltage motors up to 15,000 kW, as well as DC motors up to 600 kW. 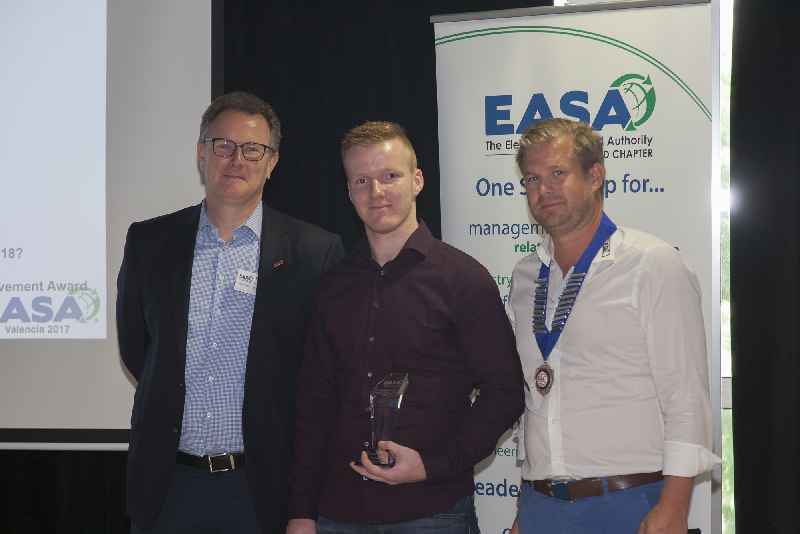 Oliver Semmler (center) of Menzel Elektromotoren receives the Karsten Moholt Achievement Award for EASA region 9 in Valencia. Oliver Semmler of Menzel Elektromotoren has won the 2017 Karsten Moholt Achievement Award for EASA (Electrical Apparatus Service Association) region 9. This prize is awarded annually by EASA to young industry technicians for special achievements. of-the art load test field in Berlin, Menzel Elektromotoren can perform vendor-independent motor tests up to 13.8 kV. The facility is also available for external tests up to 1,800 kW under load and up to 10,000 kW in idle operation. Very few independent SMEs in Germany offer comparable services. of-the art load test field in Berlin, Menzel Elektromotoren can perform vendor-independent motor tests up to 13.8 kV. The facility is also available for external tests up to 1,800 kW under load and up to 10,000 kW in idle operation. Very few independent SMEs in Germany offer comparable services. The special motor manufacturer’s services include routine, type and system examinations, notably load tests and heating tests of three-phase asynchronous motors with squirrel-cage or slip ring motors. Synchronous machines or transformers, inverters or motor systems can be put through their paces, including specially requested testing conditions. Thorough Motor testing is useful to detect and resolve possible interface problems between individual components ahead of commissioning. This obviously simplifies planning and reduces waiting times for end users. Testing whether a system can be operated safely even in extreme conditions also serves to reduce the risks associated with complex retrofitting in existing facilities. For this purpose, Menzel has custom-built a test hall with a 3 x 9 m base plate for mounting test objects and load machines next to a sound-proof observation cabin with built-in heating. The facility features two cranes that can be coupled if necessary. These can handle loads up to 16 t (hook max. 4.50 m above the clamping field) and 10 t (hook at max. 5.20 m), respectively. Heavier equipment or other lifting heights can be accommodated on request. A family-owned company with some 90 years of experience in the construction of special motors, Menzel specialize in the development and manufacturing of large electric motors for a wide variety of industries. 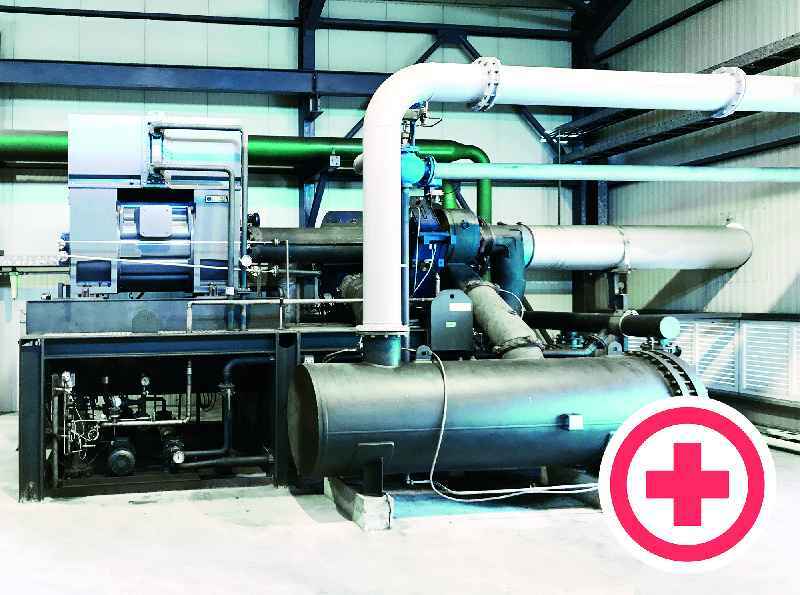 The Egyptian Construction Authority for Potable Water and Wastewater (CAPW) recently sourced four custom-made pump drives from special motor manufacturer Menzel Elektromotoren for installation in a water pump station in Cairo. Because the great volume of water processed in the plant constitutes a lingering threat for any nearby motor, these systems were required to be water-tight enough to sustain submersion at standstill without suffering damage. For this reason, the vertical high-voltage motors were finished with IP67 ingress protection, an exceptionally high grade of water resistance. The Berlin-based motor expert is one of the few manufacturers who can provide such motors. In order to achieve this robust degree of protection, Menzel provided the units with encapsulated water-proof housings and terminal boxes and specially engineered bearings. Additional gaskets made from special materials were included for each fit, and high surface pressure in all sealing surfaces were then used to achieve a complete sealing that allows these motors at standstill to be exposed to a flooded environment. The engineers used a non-corrosive housing material and subsequent surface treatment and painting process to furnish the housing with a very low surface roughness. 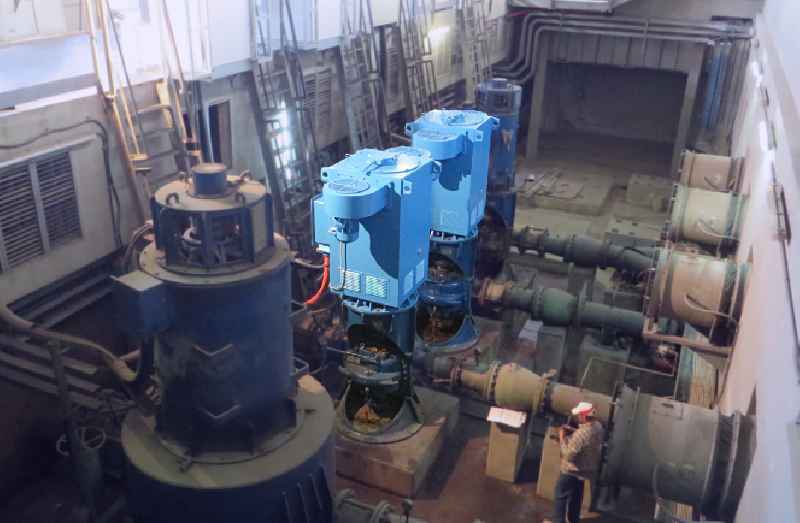 In case of imminent submersion of the pump drives in the facility, the motors can now be switched off, safely await the water to recede, and then be restarted right away. The four six-pole squirrel cage motors with 740 kW rated power, 3300 V rated voltage and 990 rpm are now instrumental to help ensure an uninterrupted water supply to the population of Africa’s largest metropolis. The replacement motor after commissioning in Cuba. Hospitals running out of oxygenMotor manufacturer Menzel delivers emergency motor to Cuba. In an urgent emergency, Berlin-based motor manufacturer Menzel Elektromotoren saved the day by delivering a spare motor on extremely short notice. June 2017, Cuba: the island state’s only compressor drive for producing oxygen for all hospitals nationwide stopped working. High-quality brushes significantly affect the properties, durability and overall performance of a motor. Carbon brushes appear to be cheap wear parts, but are actually important motor components that significantly affect a motor’s properties, durability and overall performance. Carbon brushes appear to be cheap wear parts, but are actually important motor components that significantly affect a motor’s properties, durability and overall performance. Many plant standstills could therefore be easily avoided through careful selection, professional handling and routine maintenance of the carbon brushes used in the motors, points out special motor manufacturer Menzel Elektromotoren from Berlin. „Operators often underestimate how important the plant-specific selection and quality of carbon brushes is for a smooth-running operation“, says Mathis Menzel, third-generation CEO of the family-owned company. At one customer’s plant, Menzel’s engineers found that the failure of a brand-new motor after just 24 hours had been caused by unsuitable, locally purchased carbon brushes – not a rare case unfortunately. Brush sparking then led to the destruction of the slip ring surface. Aside from the material composition, the required brush quality also depends on location-specific factors such as humidity, ambient temperature, and uniformity of load. „Time and again we also encounter a need for information regarding mechanical fit and manual handling of the brushes,“ says Mathis Menzel. „For example, one should never mix brushes of a different type or from different manufacturers and also never use brushes that are worn down more than 50%.“ Motor supplier Menzel supports operators in choosing suitable brushes for their application and provides comprehensive consultation in all matters ranging from quality of the material to the correct fit. The company offer their services and take questions 24 hours a day, all year round at info@menzel-motors.com. 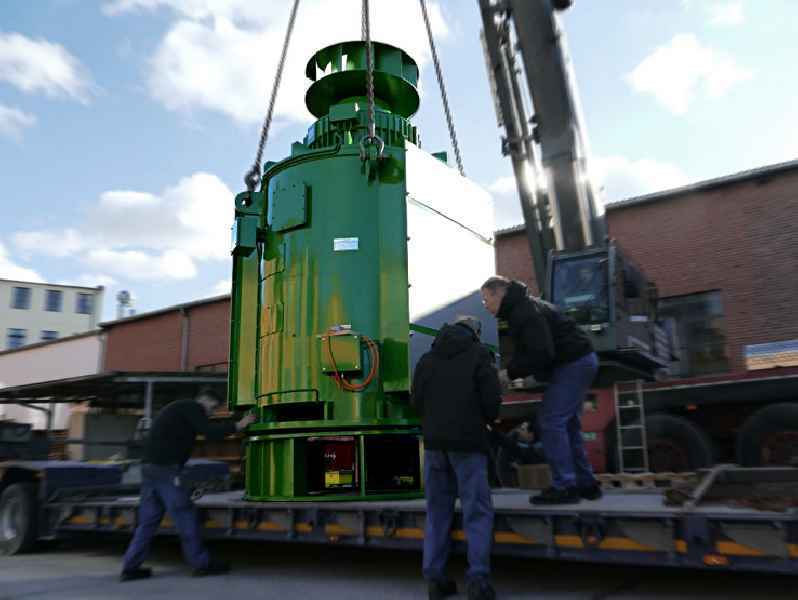 Within a day after the order came in, motor specialist Menzel Elektromotoren recently delivered a 18 ton motor with 7,500 kW rated power and a speed of 1,490 rpm-? via special transport. The motor replaced the failed compressor drive of a longtime customer and world market leader in the technical gases industry. 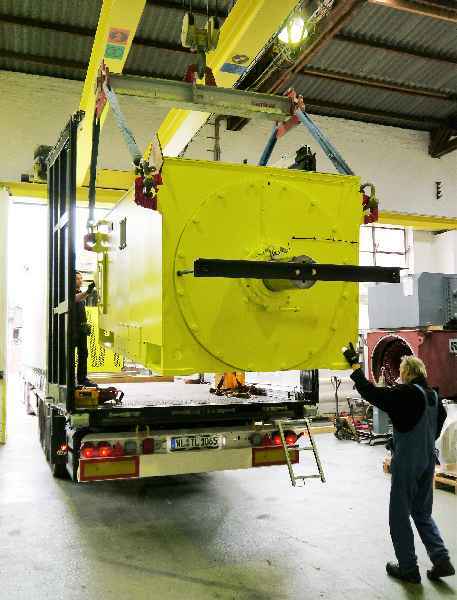 Within a day after the order came in, motor specialist Menzel Elektromotoren recently delivered a 18 ton motor with 7,500 kW rated power and a speed of 1,490 rpm-? via special transport. The motor replaced the failed compressor drive of a longtime customer and world market leader in the technical gases industry. Menzel Elektromotoren was able to react so swiftly, because the manufacturer is one of very few who are capable of providing such large-capacity motors from stock. With decades of experience in the warehousing of high-voltage motors up to 15 MW rated power, the special motor manufacturer has perfected the flexible, customized adaptation of motors to meet the customer’s technical conditions as well. A modular motor from a series specially designed for larger pumps and compressors was therefore readily available on short notice. The outlay for this job proved to be minimal. Thanks to the extremely compact design of these motors they fit in almost any application. In addition, versatile welding steel housings with variable mounting options, high-quality Renk sleeve bearings, terminal boxes that are rotatable by 4 x 90 degrees as well as a choice of various cooling options give these motors maximum compatibility. Within just seven days, Menzel Elektromotoren delivered a specially adapted replacement motor to a pharmaceutical plant in Scotland. Berlin – Menzel Elektromotoren from Berlin recently took on a particularly urgent order for the delivery of a customized, 100% electrically and mechanically compatible squirrel cage motor. Within just a week, the special motor manufacturer supplied a replacement motor, that had been specially adapted to the mounting dimensions at the pharmaceutical plant in Scotland. Despite a weight of nearly two tons, the urgently needed motor traveled to its destination by courier. Berlin – Menzel Elektromotoren from Berlin recently took on a particularly urgent order for the delivery of a customized, 100% electrically and mechanically compatible squirrel cage motor. Within just a week, the special motor manufacturer supplied a replacement motor, that had been specially adapted to the mounting dimensions at the pharmaceutical plant in Scotland. Despite a weight of nearly two tons, the urgently needed motor traveled to its destination by courier. 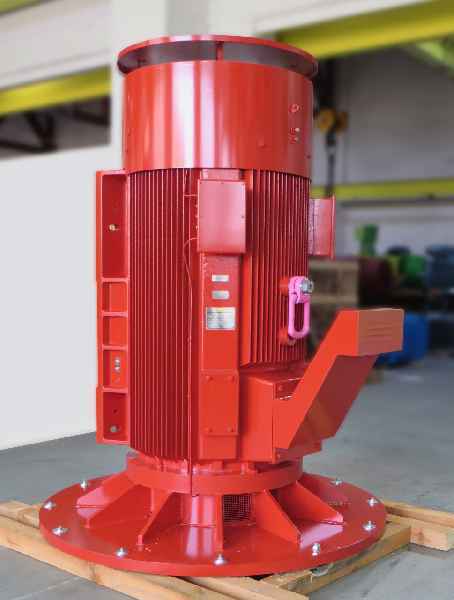 For this order, Menzel chose a four-pole motor with a speed of 1481 min-¹, 200 kW rated power and 3300 V rated voltage from their extensive stock and modified it to match the necessary flange dimensions. This necessitated not only changes to the bearings. It also meant that the engineers had to convert the horizontal B3 motor into a vertical V1 motor with special flange to ensure a precise mounting fit at the customer’s plant. Unlike major motor manufacturers with a fixed product range, the medium-sized drive expert specializes in handling such projects with extremely short response times to help customers minimize downtime due to machine failures. With more than 20,000 motors of various types in stock (low-voltage, high-voltage and DC) and the in-house shop readily available to implement custom requirements, the Berlin-based drive technology expert is quick to supply special solutions for a broad range of applications. Berlin – Menzel Elektromotoren GmbH, a Berlin-based company with a long-standing history, sent off senior CEO Kurt Menzel into retirement with a ceremonial farewell on 31. March 2017. Starting his career in 1975 as Head of Marketing, the qualified engineer took over management of the motor manufacturer from his father, company founder Kurt Menzel senior, in 1984. After more than four decades of commitment to the company, Kurt Menzel now puts leadership of Menzel Elektromotoren into the hands of his son, Mathis Menzel, who has been a member of the management for some years. Berlin – Menzel Elektromotoren GmbH, a Berlin-based company with a long-standing history, sent off senior CEO Kurt Menzel into retirement with a ceremonial farewell on 31. March 2017. Starting his career in 1975 as Head of Marketing, the qualified engineer took over management of the motor manufacturer from his father, company founder Kurt Menzel senior, in 1984. After more than four decades of commitment to the company, Kurt Menzel now puts leadership of Menzel Elektromotoren into the hands of his son, Mathis Menzel, who has been a member of the management for some years. Stepping in as commercial director will be qualified business administrator Dirk Achhammer, who first started working for the special motor manufacturer in 2007 as Head of Finance and Administration and later as Authorized Signatory. Over the course of the last 90 years, Menzel Elektromotoren has established itself as a sucessful partner for short-notice delivery of large electric motors with special adaptations, valued by customers for exceptional reliablity and delivery dependability. For his entrepreneurial engagement, company founder Kurt Menzel senior was even awarded the Order of Merit of the Federal Republic of Germany in 1977. Berlin – Menzel Elektromotoren have constructed a special motor for a customer from the plastics industry which can be used as a flexible replacement for two differently designed extruders. The operators turned to Menzel, because no „off the rack“ motor was suitable for this particular task. Berlin – Menzel Elektromotoren have constructed a special motor for a customer from the plastics industry which can be used as a flexible replacement for two differently designed extruders. The operators turned to Menzel, because no „off the rack“ motor was suitable for this particular task. With 90 years of tradition and experience in motor construction, the company specializes in the manufacture of customized motor solutions and can implement versatile adaptations and special designs in its workshop in Berlin. The motor specialist’s service also includes modifications for DC motors as in this case. The DC motor supplied by Menzel features a performance of 472 kW and nominal speeds of 1,400 or 1,710 min-1 respectively, to replace each of the two extruders if necessary. „The customer was able to avoid the costly implementation of a second spare motor, because this two-in-one replacement motor has been adapted to the on-site limitations and two different installation conditions by us,“ explains René Gaebel, Head of DC & Special Drives for Menzel. His team constructed the motor with an active terminal box on both sides and installed a custom shaft for an adjustable connection to either extruder. To accommodate the different lengths of the two motors, a flexible foot mounting with long slots at the front and back was installed as well. Berlin – Menzel Elektromotoren, a German company of long standing tradition from Berlin, looks back on 90 years of company history this year. Since its founding on September 7, 1927, the manufacturer of electric motors produces large industrial motors with special designs for a wide variety of industries and delivers them all over the world on short notice. Berlin – Menzel Elektromotoren, a German company of long standing tradition from Berlin, looks back on 90 years of company history this year. Since its founding on September 7, 1927, the manufacturer of electric motors produces large industrial motors with special designs for a wide variety of industries and delivers them all over the world on short notice. After turbulent early years – including the world economic crisis, the total destruction by bomb damage during World War II and dismantling by the Russian occupation force – founder Kurt Menzel succeeded at quickly rebuilding the company despite the Berlin blockade. By 1958 the company was able to move into new 10,000 m² large headquarters in Berlin-Tiergarten. in 1977, Kurt Menzel was awarded the German Federal Cross of Merit for his entrepreneurial commitment. Today, his grandson Mathis Menzel is the third generation of the founder’s family to manage the successful company. To ensure fast delivery to the customer under any circumstances, the motor manufacturer maintains sites in several countries and an extensive stock with numerous three-phase motors and DC motors of all cooling and ingress protection types in a power range up to 15,000 kW. And uniquely for a German company this size, Menzel has a load test field for up to 1,800 kW under load and 10,000 kW at idling speed. A company-owned service department with 50 service technicians is available to customers anywhere at short notice. In Germany alone, more than 20 service cars are used. Worldwide delivery is managed by an in-house Logistics Department. To celebrate the anniversary, Menzel offers its customers a very special deal: for motor models manufactured between 2007-2016, the motor manufacturer constructs identical re-deliveries at the old price. 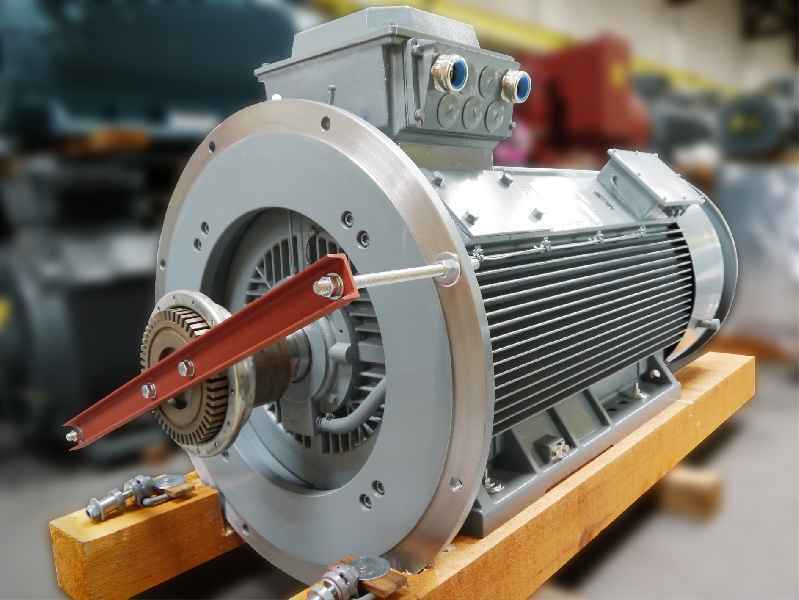 Proving their technical expertise by exactly matching all the requirements to a tee, Menzel Elektromotoren came out on top against other motor manufacturers for the construction of a fan motor for a thermal power plant. 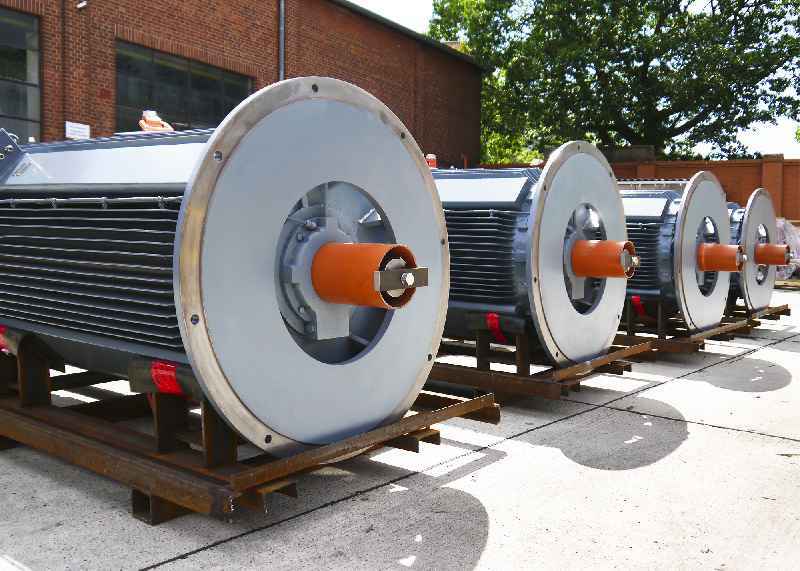 Berlin – Providing a spare for the exceptionally large fan motor at EUGENIO MONTALE, a 600 MWe thermal power plant in Italy, special motor manufacturer Menzel Elektromotoren recently built an exact replica. The 8-pole squirrel cage motor features a D5 design with a base frame and pillow blocks. At 3500 kW, 6000 V and about 25 tons of weight, the extremely large specimen is also exposed to ambient temperatures of up to 60 °C. Menzel, a family-owned company from Berlin, received the commission because they were the only provider able to implement all of customer ENEL Produzione SPA\’s technical requirements, despite the motor’s enormous size. This included in particular a completely identical efficiency. 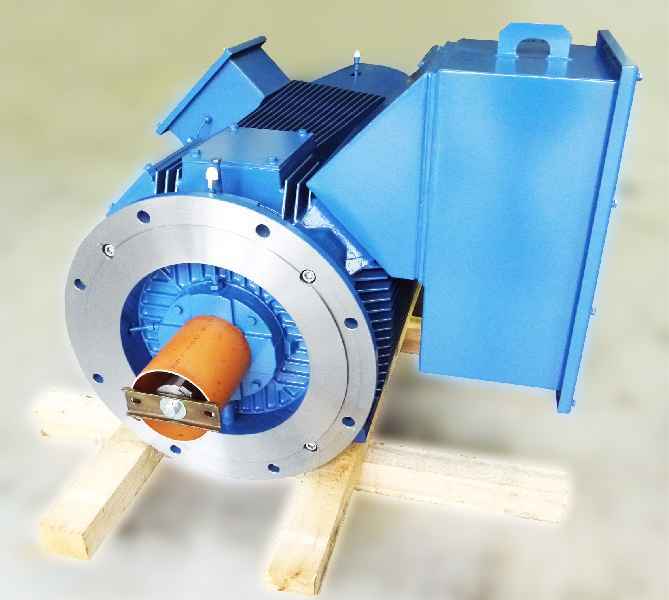 The original motor manufactured by ASGEN ITALY in 1973 has special design features such as external sleeve bearings, custom external dimensions and a dedicated base frame. It also features a very large inertia moment of J=11250 kg/m². Taking into account all these factors, Menzel constructed the spare machine with identical mounting and shaft dimensions and the exact same axis height. The sleeve bearing and terminal boxes as well as the oil and water connections were positioned in accordance with the original motor. Menzel also fulfilled the special request by the customer for a tangent-delta check and partial discharge measurement. 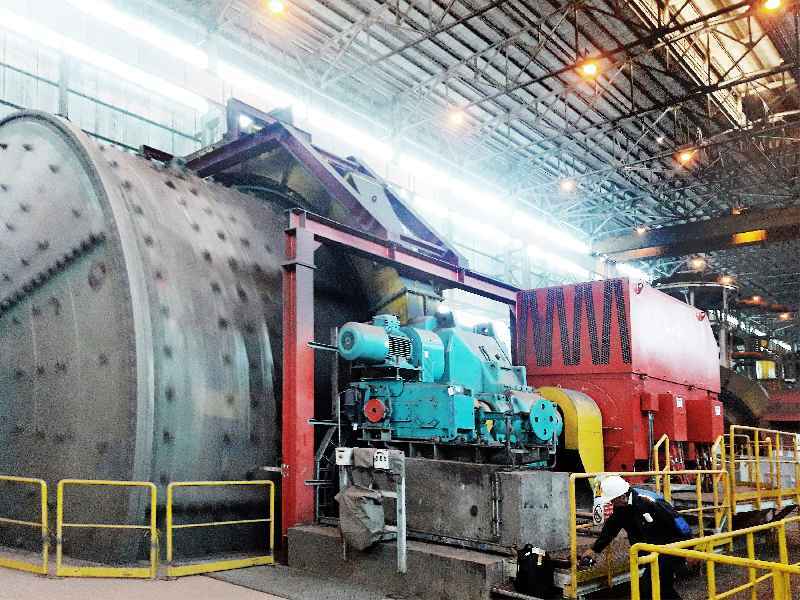 Berlin – For a major inspection process, a Senegalese cement manufacturer had to replace their old coal mill and install a technically and mechanically compatible replacement motor in 2015. Tasked with this assignment, Menzel Elektromotoren from Berlin was faced with a particularly dusty challenge. The motor, which provides the plant with finely ground coal dust to meet the plant’s primary energy needs, is operated in a hazardous area classified as zone 22. While ground coal offers better caloric properties than briquets, particles of conductive dust left on slip rings and brushes may cause sparks and lead to an explosion. The motor therefore required a design that would reliably prevent dust ingress during all operating stages. To meet these challenging requirements, the German manufacturer of custom motors engineered a rugged unit with IP65 ingress protection. Because a squirrel-cage motor requires a high starting current and has a lower starting torque, a slip ring motor was chosen. 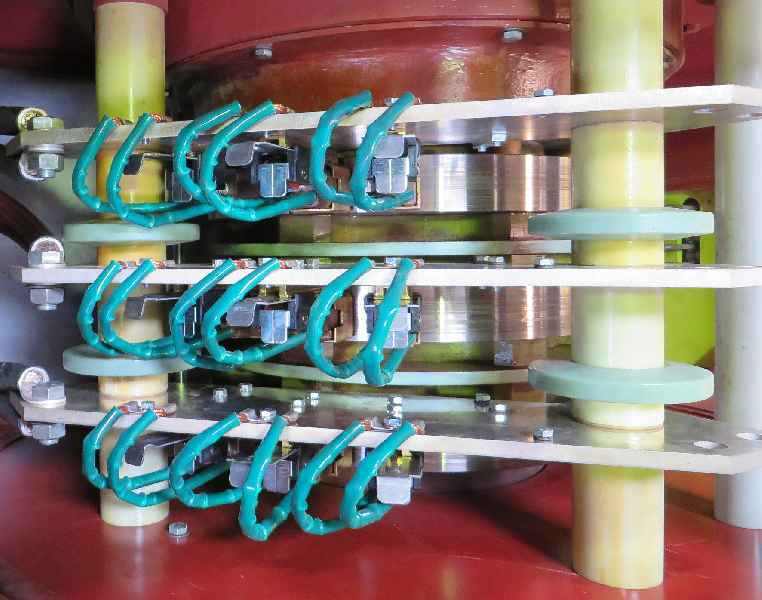 A special motor construction was then devised for the application: the system features special terminal boxes for the stator and rotor, a non-magnetic cable entry plate, and hazardous area terminal clamps for the auxiliary terminal boxes. In addition, the motor housing is slightly larger to ensure the operating temperature does not exceed +125 °C. Additional fixing points between the radiator and housing facilitate tightening of the sealing in-between. The engineers also reinforced Menzel’s standard viewing windows for the slip ring chamber with bolted covers and plexiglass to ensure proper tightness. Thanks to these measures, the replacement motor has received a Ex II 3D Ex tc IIIB T125°C Dc explosion protection marking and reliable delivers top performance in zone 22. 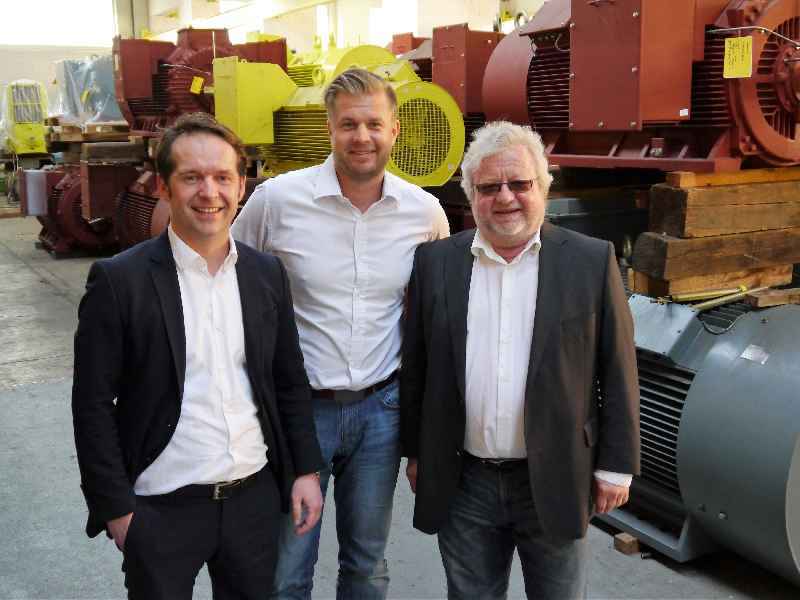 Berlin – Menzel Elektromotoren from Berlin has recently engineered a specially adapted replacement motor for a compressor drive in a Spanish steel mill. 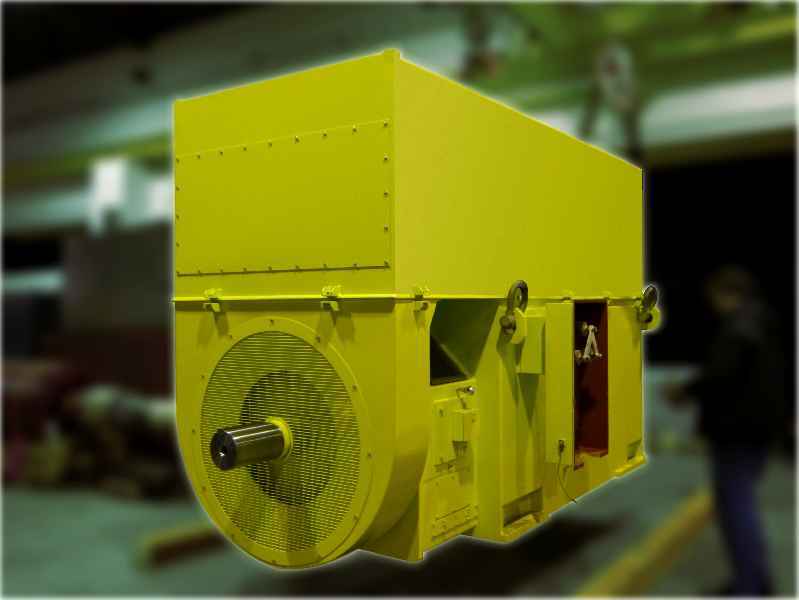 The squirrel-cage induction motor with 3,400 kW rated power, 6000 V voltage and a speed of 1,490 rpm not only must ensure the compressed oxygen and nitrogen supply to the mill, but also has to drive a lubricant pump. Due to these requirements, the motor had to be equipped with a second auxiliary shaft end. Menzel Elektromotoren were awarded the contract for this project by their longtime customer, because the family-owned company has successfully implemented numerous sophisticated solutions before and gathered extensive relevant experience in the process. 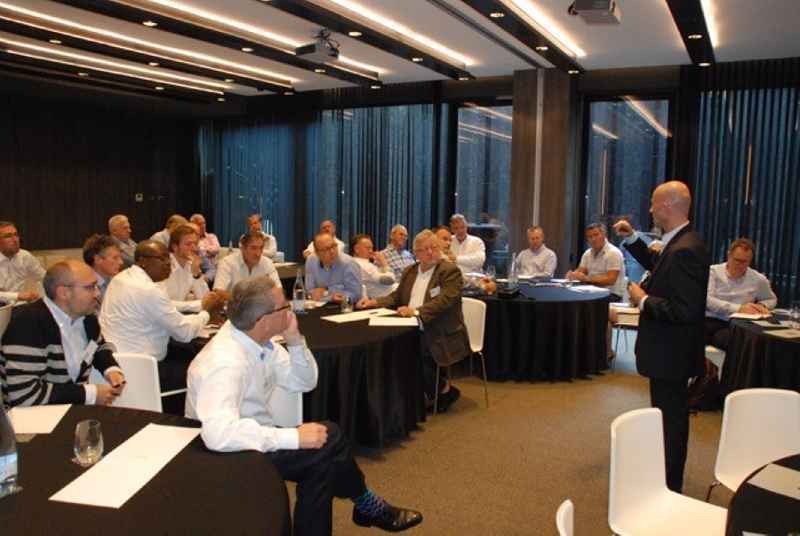 In order to ensure the absolutely reliable interchangeability of the legacy unit and new system, the motor manufacturer dispatched two staff to Barcelona prior to construction to determine the exact operational and structural requirements on site. Based on that data, the replacement motor was then built with the required dimensions, an identical terminal box system, the vibration monitoring system requested by the customer, and two shaft ends for the compressor and the oil pump. Furthermore, the Menzel engineers devised a custom-dimensioned frame to accommodate the additional pump. The new unit is now ready to be commissioned and will soon take up regular operations. Berlin – Menzel Elektromotoren from Berlin, Germany recently delivered two motors for a cement mill and a classifier to a cement plant in Bolivia. The mill, which manufactures high-strength cement with 5000 Blaine, is not only the country’s first vertical roller mill for cement grinding. At 4000 meters above sea level it is also the highest installed elevation of an OK mill in the entire Americas. Berlin – Menzel Elektromotoren from Berlin, Germany recently delivered two motors for a cement mill and a classifier to a cement plant in Bolivia. The mill, which manufactures high-strength cement with 5000 Blaine, is not only the country’s first vertical roller mill for cement grinding. At 4000 meters above sea level it is also the highest installed elevation of an OK mill in the entire Americas. Therefore, very particular technical attention had to be paid to the motors‘ durability and ruggedness. Menzel modified their maintenance-friendly standard motors designed for the cement industry even further so they would withstand the special operating conditions. During the planning phase, the drive engineers and the customer closely cooperated in determining the most efficient and economical application design for the drive solutions, eventually deciding on a change of voltage levels, construction of a foundation plate and the installation of a vibration monitoring system for integration into the control as requested by the customer. The German motor manufacturer’s flexibility and speed were once more decisive for this customer’s placement of an order. After commissioning in September 2016, more than ten motors from Menzel will be powering machines in the Bolivian cement plant. 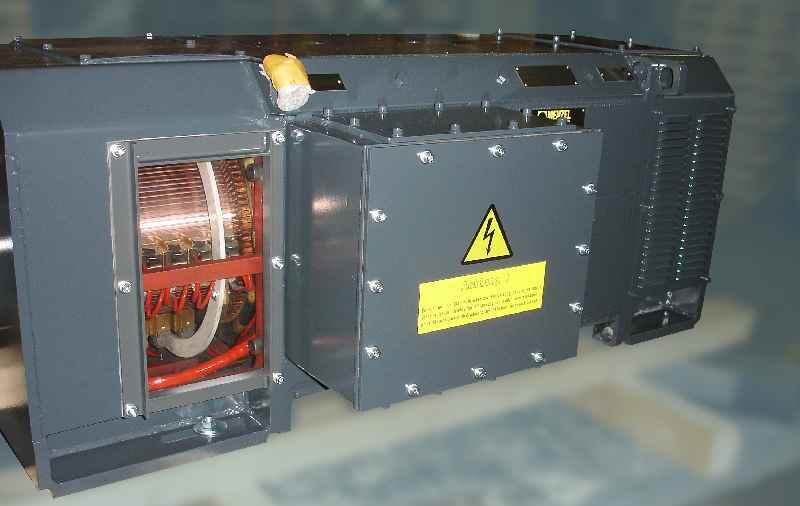 Berlin – A six-pole squirrel-cage motor with 802 kW rated power and a speed of 990 min-? underwent a particularly extensive scope of modifications in January 2016 at German motor manufacturer Menzel Elektromotoren. 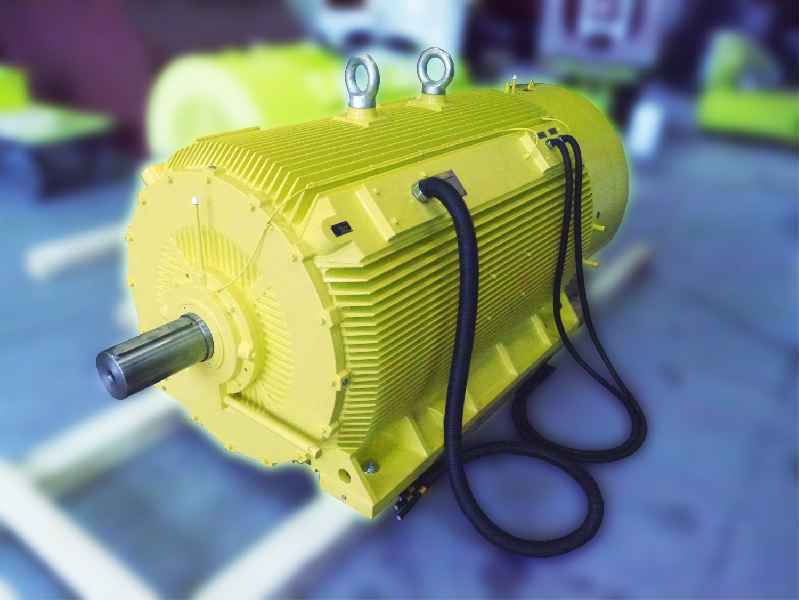 Berlin – In 2015 Menzel Elektromotoren from Berlin have constructed a 100% compatible replacement induction motor for a Malaysian power plant and are also ensuring its delivery, installation and eventual commissioning on site. 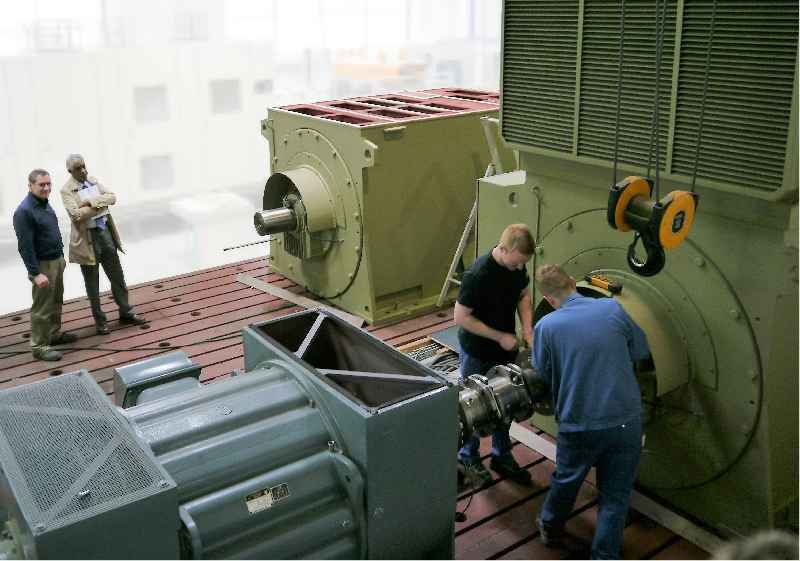 Berlin – When a compressor motor failed at a Swedish specialty paper mill, Menzel Elektromotoren delivered the urgently needed replacement drive: a 4-pole squirrel cage motor with 710 kW, 6000 V rated voltage and a speed of 1489 min-?. Berlin – In November 2015, electric motor manufacturer Menzel Elektromotoren from Berlin, ended a serious production interruption at a cement plant in Cambridge.